A professional in the kitchen requires, above all, quality, safety and hygiene. 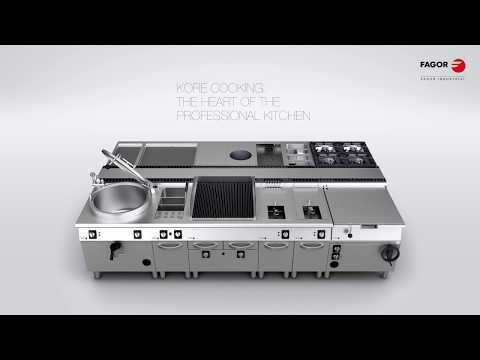 We also add reliability, design, technology and comfort to all our cooking ranges: Symphony, 900, 700 and 600. Robust, ergonomic and easy-to-clean cooking, designed to offer higher level performance with maximum versatility, allowing us to offer the best solutions to the kitchen professional. The Symphony line of kitchens allows the professional chef to design a tailor-made kitchen, laying out and adapting the different elements of the kitchen to suit their taste and adapted to their way of working. A wide range of top quality and design elements, shapes, sizes, accessories and finishes allows you to create the perfect tool with which to delight your public. The 700 Range from Fagor Industrial offers excellent features and obtains high levels of performance in more reduced spaces. It is the perfect solution for businesses with more limited space. With our 600 Range we offer a small modular range especially designed for bars, cafés, and small communities of any sort.